Speaking to investors during a call with analysts, Qualcomm CEO Steve Mollenkopf said Apple's lawsuits, lodged in U.S. and Chinese courts, are less about finding justice than they are getting the best deal on parts, reports CNet. "Apple's complaint contains a lot of assertions, but in the end, this is a commercial dispute over the price of intellectual property," Mollenkopf said, in line with Qualcomm's public statement on the matter issued last week. "They want to pay less for the fair value that Qualcomm has established in the marketplace for our technology, even though Apple has generated billions in profits from using that technology." Qualcomm president Derek Aberle, who previously headed up the company's licensing department, echoed the sentiment, saying, "At the end of the day, they essentially want to pay less for the technology they're using. It's pretty simple." 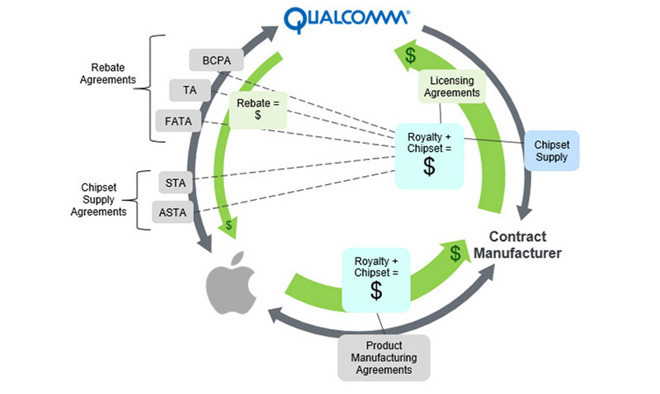 Apple last week filed suit against Qualcomm, asserting the firm's IP licensing strategy involves monopolistic practices, price gouging, extortion and more. Specifically, Apple alleges Qualcomm abuses its "monopoly power" of the mobile wireless chip market to flout FRAND (fair, reasonable and nondiscriminatory) patent commitments and charge customers exorbitant royalty rates on standard-essential patents. The U.S. suit also claims Qualcomm only sells chipsets to buyers who have first agreed to license its SEPs, a practice Apple refers to as "double-dipping." Triggering the suit, Apple says, is nearly $1 billion in unpaid licensing rebates. According to Apple, Qualcomm withheld payment after the company cooperated with a Korea Fair Trade Commission probe into the chipmaker's business practices. The KFTC ultimately leveled an $854 million fine against Qualcomm for what it calls an "unfair business model." The U.S. FTC accuses Qualcomm of much the same in a separate lawsuit lodged last week. During the call, Aderle accused Apple of making "false and misleading" statements to regulatory agencies and "regularly driving regulatory attacks on Qualcomm's business around the world." Adding to the pile, Apple filed two more suits in China earlier today asserting similar allegations as the stateside suit. In one, the company seeks 1 billion yuan ($145.3 million) in damages based on Chinese iPhone sales, while the other pertains to unfair SEP licensing practices. During today's investor call, Qualcomm executive vice president and general counsel Don Rosenberg took exception to the multiple concurrent complaints. "We don't believe we have monopoly power in the chip market or any other market," Rosenberg said, according to TechCrunch. "We have never prevented Apple or anybody else from buying from competitive chipmakers." Despite increasing legal pressure, Qualcomm said it will honor Apple's existing chip orders, confirming a Monday report. More specifically, the executives explained Apple's chip supply comes from contract manufacturers who license Qualcomm IP, meaning the chipmaker is technically upholding those agreements. Ironically, contract manufacturers are at the crux of Apple's U.S. lawsuit. According to the legal filing, Qualcomm negotiates secret licensing agreements with smaller CMs instead of larger companies like Apple that use the wireless chips. With comparatively less bargaining power, these CMs are forced to pay "exorbitant" royalties on non-FRAND terms, which are then passed along to bigger firms. In any case, Mollenkopf does not view the recent spate of lawsuits as a threat to Qualcomm's business. "We have a long history of successfully defending our licensing and practices business model, which have been tested around the globe," he said, according to CNet. "We are very excited about the future and many opportunities directly in front of us. I am confident we will address and get through the legal challenges underway as we have done many times in the past."